Our correspondence with the three Cricket Green Ward Councillors following the council giving itself planning permission for two multi use games areas at the Canons, in the heart of the Cricket Green Conservation Area continues. We have already published our initial open letter to ward Councillors. This received a response which, we are disappointed to say, failed to address our points. So we have sent a follow up letter. Below you can read the Councillors response to our original letter, and our follow up letter. We hope this time to get a more encouraging reply. Thank you for your response to our letter following the grant of consent for the two floodlit sports pitches in the grounds of the Canons at the heart of the Conservation Area. Unfortunately this does not allay our concerns and does not respond to the specific issues we raised. We are well aware of the planning framework for Cricket Green and the details of this application. They did not need to be repeated at length and your citing of the details in terms which are very much from a planning perspective does not address the key questions we posed in our letter. We are therefore asking you once again, and very specifically, to address the issues we raise. It is your role as councillors to exercise judgement based on relative priorities when faced with planning applications. If you valued the Conservation Area then you could all have registered objections at the planning committee. You could also have sought appropriate planning conditions which can be applied as readily to applications made by the Council as to those from any other developer. This application was recognised as being in conflict with planning policies for the area and could have readily been refused. It is not unusual for officer’s recommendations to be overturned, as with the Fair Green canopy and a previous application to demolish the Cricketers (in both these cases we have welcomed your support). We are interested in the new information provided in your letter about the detail of the Sports Development Plan. Notably this was not available during consideration of the planning application, and was not therefore able to be considered as part of the application. Disappointingly it confirms an exclusive focus on football but otherwise adds nothing new. There is no guarantee that the facilities will be affordable enough to implement the Sports Development Plan and no reason why these needs could not be met on neighbouring floodlit facilities – such as Cranmer School and the KNK stadium – and by a more sensitive redevelopment of the former tennis courts without floodlights. In our earlier letter we asked specifically for your support on two issues to mitigate the impact of the MUGA – ensuring the facilities are affordable to local people and reducing the period of floodlighting. You did not respond specifically on either point. Both matters are still in the gift of the Council and would be positively affected by your advocacy. We ask that you confirm that you are making representations on these issues and to keep us informed. We are disappointed by the tone of your statement that you “will continue to deal with all planning proposals on their merits and speak out when necessary”. This is an equivocal turn of phrase used widely by professional planners and does not inspire confidence in your commitment to Cricket Green Conservation Area. It was clearly necessary to “speak out” on this occasion, and you all singularly failed to do so. 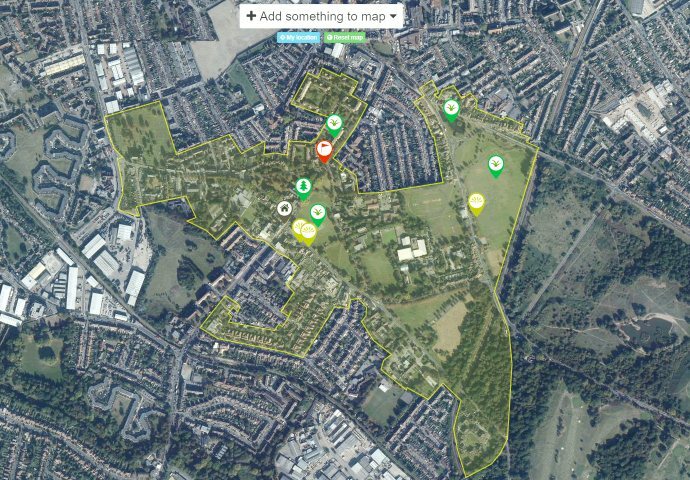 We ask you once again to re-commit yourselves publicly to protection of Mitcham Cricket Green Conservation Area and to resisting all development that fails to enhance its special qualities. Without such a public commitment we fear we will lose any confidence in your roles as ward councillors representing Cricket Green and its Conservation Area. We look forward to your reply and will publish this correspondence and make it available on our website. You have asked us to respond to your open letter expressing your concern about the recently approved application for the conversion of 2 existing tarmacadan tennis courts in the Canons into 2 multi use games areas with 6 x 6m high floodlighting masts, 5m high weld-mesh fencing to the perimeter and a net roof above. You say you are “shocked and disappointed” by the decision made by the Planning Application Committee meeting on the 12th December. All Planning Applications should be determined having regard to existing, up to date Local Plans, unless material considerations indicate otherwise. • The Unitary Development Plan (adopted October 2003) excluding those policies that were not saved in September 2007, following scrutiny by the Government Office for London. After a Public Inquiry in January 2014 the Sites and Policies Plan and Policies Map will replace the UDP 2003. In determining applications regard should also be had to Section 16 (2) of the Planning (Listed Buildings and Conservation Areas) Act 1990 (1990 Act), regarding applications for Listed Building Consent which places a statutory duty on the Council as local planning authority to have special regard to the desirability of preserving the building or its setting or any features of special architectural or historic interest which it possesses. With regard to Conservation Areas, Section 72(1) of the 1990 Act provides that “special attention shall be paid to the desirability of preserving or enhancing the character or appearance” of the conservation area when determining applications in those areas. In addition the National Planning Policy Framework (NPPF) sets out Government Policy on planning matters in England and Wales. All local plans should be in conformity with national policy. In your letter you raise concerns that the development may have a detrimental effect upon the Conservation Area, that the use of floodlights would be intrusive and that the Multi Use Games Area would not provide for local people. All of these matters were considered in the report to Committee including, in particular, the potential for the development to affect the surrounding area, including any possible effect upon the resident Bat population. As you will be aware the Report made it clear that Natural England does not object to the proposed development in respect of the protection of bats. On the basis of the information available, their advice is that the proposed development is not likely to affect bats through damage or destruction of a foraging area for a maternity roost of bats. They are satisfied that the proposed mitigation is broadly in accordance with the requirements of the Bat mitigation guidelines and should maintain the population identified in the survey report. All works should proceed in accordance with the approved mitigation strategy, to maintain lighting curfews and habitat management measures. The proposal would provide new and improved sports facilities meeting a recognized need, would enhance biodiversity in the area and by virtue of appropriate mitigation measures would not affect the protection of bats in the area. It is acknowledged that the proposals would have had some impact on the conservation area; however, the key new feature, namely the floodlighting columns being reduced in height will reduce this risk. The development when considered against the backdrop of the various buildings that make up the Cannons cluster of sports facilities will be largely unseen from the listed buildings and other structures in the Canons. It was considered that the character and appearance of the Conservation Area would be preserved and that on balance the potential benefits would outweigh any visual impact. The proposal was considered acceptable and in accordance with the London Plan (2011), The Council’s Core Strategy (2011) and the Council’s Adopted Unitary Development Plan (2003). 5. Non-Standard. The mitigation measures shown on drawing no. 111-0701-006 Rev A shall be carried out prior to commencement of development hereby approved and shall be retained thereafter. Reason: To protect the biodiversity and local wildlife in the area and to comply with policies CS13 in the Merton LDF Core Planning Strategy (2011) and 7.19 in the London Plan (2011). Reason: To protect the biodiversity and local wildlife in the area, to protect the amenities of neighboring occupiers and to comply with policies PE.2 in The Council’s Unitary Development Plan, CS13 in the Council’s Core Strategy 2011 and 7.19 in the London Plan. 7. Non Standard Prior to first use, a monitoring report setting out the mitigation methods as detailed in the Bat Mitigation Plan 2013 shall be submitted to and approved in writing by the Local Planning Authority. • A monitoring report ensuring that all mitigation measures are effective shall be carried out before any pitches can be used. Taken together with all the approved planning conditions the MUGA is acceptable in respect of all appropriate planning matters relating to the provision of sports pitches, the preservation of protected species, the enhancement of biodiversity and the preservation of the Conservation Area. All proposals for development within the Conservation Area (or anywhere else) will be determined having regard to the principles in the Council’s Local Development Plan. We will continue to deal with all planning proposals on their merits and speak out when necessary. This entry was posted in Cricket Green Conservation Area and tagged Canons, Cricket Green Conservation Area, floodlights, MUGA, Planning Applications on January 3, 2014 by mitchamcricketgreen. We would like to reassure you that we are not now, and have no intention of becoming an organisation which is politically motivated. Mitcham Cricket Green Community and Heritage has no interest in party politics. Merton Council’s application to build flood lit sports pitches in the Cricket Green Conservation Area was objected to not just by us, but also by a large number of local people. Our concern is that none of our ward councillors stood up for the Conservation Area during the planning process, and they do not seem prepared to commit in writing to standing up for the Cricket Green Conservation Area in the future. It is the lack of willingness to do this which we find unacceptable. What reasons could they have for so wilfully refusing our request made in public, in plain English now on three occasions? Hopefully we will receive a positive response to our most recent request for the commitment, and this matter can be resolved. As someone considering whether or not to renew their membership of MCGCH I wish to register these concerns: It seems to me that the Councillors’ response to the open letter does indeed show commitment to the Cricket Green Conservation area of Mitcham. Their reply points out that all the issues raised for consideration were taken into account as part of their deliberations. That their conclusion differed to that of the MCGCH does not I believe imply a lack of commitment to the Cricket Green area, but rather, a different opinion and therefore a different decision to that hoped for by the society. I have recently become increasingly upset by the apparent politicisation of the MCGCH. I have absolute confidence in the Councillors’ commitment to the area and do not consider the demand for a formal declaration to be either warranted or fair.